Meanwhile, New Delhi and Washington have found common ground on both strategic and economic issues. However, this does not necessitate a skeptical view of the New Delhi-Beijing relationship’s potential. Beijing and Washington have dissonance on many strategic issues, but still share a robust economic relationship. Neither India nor the United States should look at Sino-Indian relations as a zero-sum game. Former Chinese Premier Wen Jiabao wisely stated that the world is big enough for both India and China to grow. 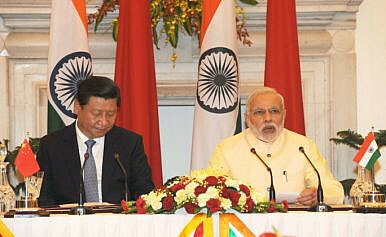 Indian Prime Minister Narendra Modi has emphasized that India and China will need to work jointly in the 21st century. China and India both understand the need for connectivity. In this context, both countries seem to have made some progress on the Bangladesh, China, India, Myanmar (BCIM) Corridor, an important component of China’s One Belt, One Road project. A number of U.S. analysts told me that India should focus on the BCIM Corridor instead of worrying over China’s investment in Pakistan through the China-Pakistan Economic Corridor (CPEC). Efforts are also being made to increase connectivity between both countries by increasing the number of flights. In the economic sphere, there is much room for improvement between New Delhi and Beijing. The balance of trade is presently skewed in favor of China. For the period April 2015-January 2016, India’s trade deficit was $44.7 billion, with India’s exports to China standing at a mere $7.56 billion while imports stood at $52.26 billion. For 2014-2015, the trade deficit for New Delhi was estimated at $48.48 billion. However, Chinese investments in India are increasing. A number of decisions can be taken quickly by the State governments. These interactions also make the State governments more sensitive and aware of the international dynamics and requirements. Liberalizing visa regimes will also help strengthen people-to-people contacts and trade. India has bolstered the relationship by beginning an e-visa facility for Chinese citizens. This improvement is evident in the increase in number of tourists arriving in India on e-visas, which has gone from a little over 2,700 in October 2014 to 56,477 in October 2015. It is important for members of the strategic community and the government in the United States who study India to interact with analysts outside Delhi. It is also critical to understand the increasing links between a number of state governments in India and China. Finally, U.S. and Indian analysts alike will benefit from realizing that there is no contradiction between India strengthening its ties with the United States while also keeping a reasonable and open relationship with China. Tridivesh Maini is a Visiting Fellow at the Stimson Center, Washington, D.C. and a Senior Research Associate with the Jindal School of International Affairs, OP Jindal Global University, Sonipat.